See also: American Buffalo; Passenger Pigeons. The Plains Bison of the American West and the larger Wood Bison of the boreal forests in western Canada up through Alaska. The animals can weigh over 2,000 pounds and be over 6 feet tall at the hump. The Texas Bison Herd at Caprock State Park was designated as the Official Bison Herd of Texas in 2011. The Bison is the state animal of Oklahoma. · In the early colonial period bison roamed throughout most of eastern North America. Their sheer size made them an important food source, one animal yielding up to 1,200 pounds of meat. · By 1770 they had disappeared from America east of the Mississippi. · In 1850 there were more than 20 million head of bison sharing the western plains with 50 million open range longhorn cattle. · By 1890 only a few hundred bison remained. Estimates on the number of bison that roamed the North American continent range from 30 million to over 60 million. Whichever estimate you accept, the fact is that when white civilization began to move west, bison slaughter followed. Some were killed for hides and food; many were killed just for the sport. The railroads accelerated the slaughter, and it fit with U.S. government policy to kill off the bison, which were the mainstay of the plains Indians. No bison, no Indians. No Indians, more room for white settlers. By about 1890 there were only 500-900 bison left alive. Out of 30-60 million. Think about it. *The National Bison Association encourages the name Bison to differentiate the American buffalo from the Asian Water buffalo and African Cape buffalo. The American buffalo is not a true buffalo. 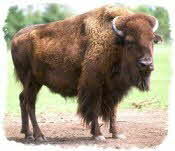 Its scientific name is bison and it belongs to the bovine family along with domestic cattle.